World Metal News: Metallica, Tool, DsO, Khemmis, Iced Earth, WWF, Peter Jackson, and more! There’s a growing outrage over the phenomenon of “Fake News”. Fortunately, every news story you’re about to read is 100% true. Metallica once again change the future course of metal, stunning the world by making the unprecedented move of releasing a full-length split with themselves. A Spiral Autumnal keyboardist/flutist rallies against implementation of equal pay/equal work for live concerts after only briefly featuring on latest album’s interlude tracks. Long standing underground label Ruptured Records makes a month of profit for the first time in its history after hiring overnight internet shop bootlegger to handle merch sales and promotion. First recorded instance of Exhorder‘s The Law being sold to someone unaware of Pantera comparisons. Waning bestial/war metal label Black March passes mandatory conscription laws to fill ranks after heavy losses to attrition, heart-failure and angery reacts. Khemmis achieve breakthrough, returning with easily the second best album of their career to widespread critical acclaim. 4-piece prog-fusion metal act Jazzturb8 found to contain sufficient noodling to be officially referred to as a “quartet”. Blackgaze band Starenoir arrested on-stage mid-song for loitering. After months of calculations, woke af Tool fan reveals that the increasing time gaps between each of the band’s albums is following the Fibonacci sequence divided by 9 and then multiplied by 11, meaning the next album will be released in late 2074. Overjoyed fans react by dubbing it a masterpiece of musical progression, set pre-order sales records, and claim that detractors just “don’t get it”. Decibel confuse readers by releasing December issue in December. Sole member of tech-death outfit Extracting The Micturition kicked out after drum machine achieves sentience and assumes control of the project’s future. New autonomously recorded album leaks, fans complain it sounds too similar to previous material. Deathspell Omega add “DsO” to their list of influences in order to reach new fans. 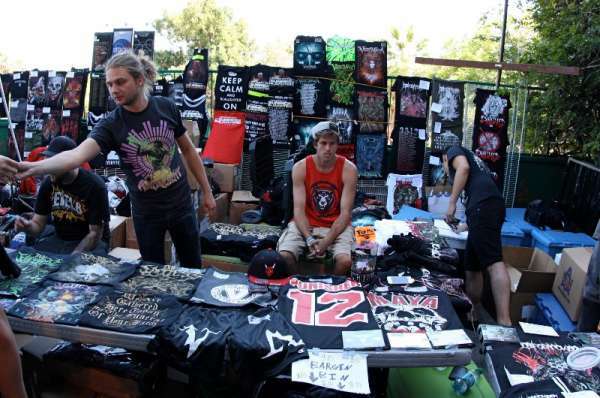 5 year long undercover investigation reveals merch table actually glorified desk. Press release accompanying promo for seminal D-Beat band Anarchist Killer‘s first material in 21 years takes more time to complete than the album. Local promoter books 3 supports for touring European black metal band, event runs smoothly as everything goes as planned. Peter Jackson agrees to direct film clip for New Zealand-based Tolkien-themed medieval black metal band Dung Draugr. Buckles under pressure from the label to split the 3:12 minute track into 3 separate video clips released across 3 years. Fans revolt. Metal fan claims to read end of year lists for a purpose other than reaffirming his own taste. Trump continues surprise cabinet announcements, appointing new 5FDP head-dong Phil LaBonte as chief social media advisor, duties said to include getting in touch with the thoughts and ideals of the dissatisfied millenial demographic, immediately telling them they’re wrong/hate freedom, and systematically blocking any dissidents. Dad-rock band win 38 year-long battle for custody of their discography, allowing them to play their songs on Thursdays, Mondays (after 5pm), and every second Sunday. Survey into low polling day turnout reveals thousands of disenfranchised voters found to have tuned out “all this annoying election talk” during the last few months by listening to their usual diet of politically charged grind and black metal. World Wide Fund for Nature (WWF) condemn live show antics of popular new Australian metalcore band ipunchedarooonce after viral video of drummer preparing for their first tour surfaces. USA lifts decades long embargo with several volatile former Soviet states, enters trade talks with the goal of swapping approximately 3.1 million generic stoner bands for 6 black metal groups in an effort to quell tension in the area. Gatecreeper forced to shift several upcoming tour dates after local court rules the band name cannot come within 500 feet of any school. Previously conservative-leaning Iced Earth frontman Jon Schaffer performs backflip and undertakes string of appearances across alt-right media positing the world desperately needs to work towards combating global warming by reducing atmospheric CO² concentrations back below 370ppm, a level not seen since 1998, the year coinciding with his band’s last worthwhile album. Marshall allegedly working on a grind-specific amp model capable of producing 26 different types of feedback complete with zero tone settings. Fans of atmospheric post-metal act eMotive excited after band announce they’ll be moving a new direction following their breakthrough first album – obscurity. Pizza thrash band Supreme Do(ugh)mination kicked off stacked Salami Tsunami tour (feat. Municipal Waste, Lich King, Condition Critical, Havok etc.) after vocalist goes on mid-concert anti-pineapple rant. After news surfaced of an alleged studio scuffle with other instruments over recording volume discrepancies, Lars Ulrich‘s snare said to have demanded personal trailer for the band’s upcoming international tour. Antifa protests at recent NSBM-affiliated Hatred Heritage festival backfire as their presence triples traditionally dismal attendance figures to a record of 39, thereby increasing interest in future events.